Parboil the oysters in a large stockpot in their own water until they start to curl on the ends. You do not want to overcook the oysters. Drain and discard oyster water. Then move on to making a Bordelaise sauce by blending garlic in processor for 20 to 25 seconds until finely chopped. Then blend parsley in processor for 20 to 25 seconds until finely chopped. Combine garlic and olive oil together in a microwave-safe bowl and microwave on high for 3 minutes. Add parsley to bowl with garlic and olive oil. Mix all 3 ingredients well; this completes the Bordelaise. 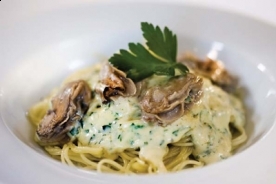 Warm the Alfredo sauce and add the Bordelaise sauce and oysters. Serve over cooked pasta and enjoy.